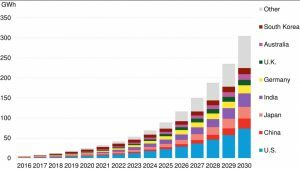 Amory Lovins’ Rocky Mountain Institute, backed by Chinese institutions and Lawrence Berkeley National Laboratory, has published a stunning roadmap for an energy revolution in China. If its ideas are taken up, it could lead to a transformation of the largest energy economy in the world – and serve as a model for other developing nations to follow, writes Fereidoon Sioshansi, president of Menlo Energy Economics and publisher of the newsletter EEnergy Informer. 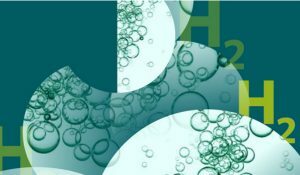 In 2011, Amory Lovins and his colleagues at the Rocky Mountain Institute (RMI) published Reinventing Fire: Bold business solutions for the new energy era. As has been his style, and as suggested by the book’s subtitle, Lovins was bold in his assessment of how much – or in this case how little – energy will be needed to fuel US economy’s continued growth and prosperity while maintaining the American standard of living. Lovins’ answer – you guessed it – was a resounding yes to both. Almost poetic, fantastic, and too good to be true. It is classic Lovins. To make its points and support its conclusions, the book examines 4 major users of energy in the US, transportation, buildings, industry and electricity and shows how we can get by with less energy while transitioning to a cleaner, greener and more sustainable future. The most amazing thing about the book’s thesis is not only that it can be done, but the transition will in fact save us money. As Lovins likes to remind us, energy efficiency is not just a free lunch, it is a lunch you are paid to eat. The 2011 book, like his 1976 Foreign Affairs article, is controversial. His supporters hailed it as the energy road map for the future while many in the fossil fuel industry, coal and oil dismissed it as fantasy or worse. 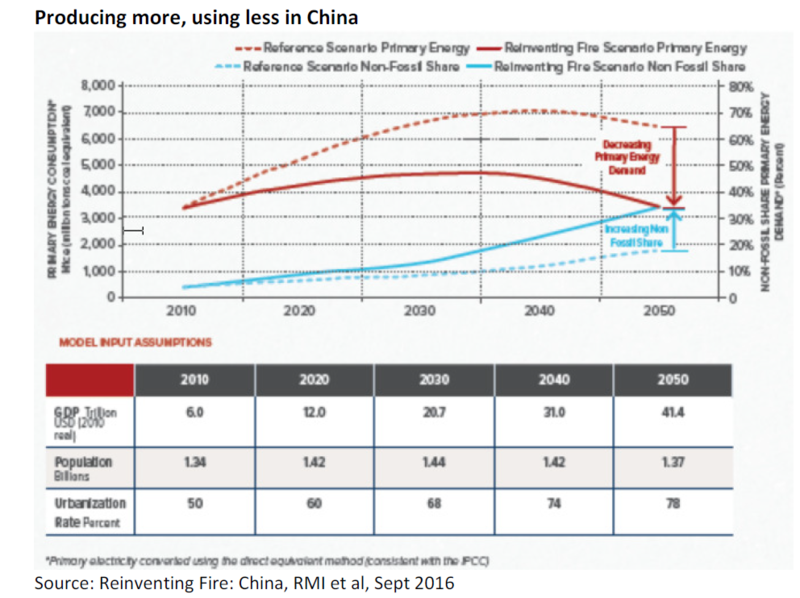 Fast forward to September 2016 and a new study called Reinventing Fire: China; A roadmap for China’s revolution in energy consumption and production to 2050. It is an attempt to do for China what was done for the US. 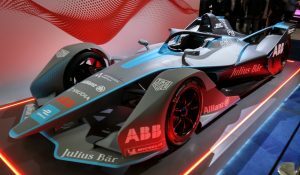 The study is a collaboration of Energy Research Institute of the National Development and Reform Commission of China, RMI, Lawrence Berkeley National Laboratory (LBL) and Energy Foundation China. It took over 3 years with input of all these organizations. Reinventing Fire: China is perhaps even more ambitious and bold than its US counterpart, partly because China is still a developing economy with vast growth aspirations, not just in terms of its economy but to uplift millions of people from poverty to middle class, manage the biggest migration of rural populations to cities, industrialization, while keeping its air clean, water drinkable and responding to the demands of its citizens, who aspire to enjoy high standards of living as in developed economies. To start with, the report proclaims that you can have your cake and eat it too: economic growth and prosperity can be sustained while using far less energy, emitting far less carbon, and generating far less waste and environmental damage (graph 1). Apparently the report has support among the highest levels of government in China, where vast resources are going into building a new energy infrastructure. 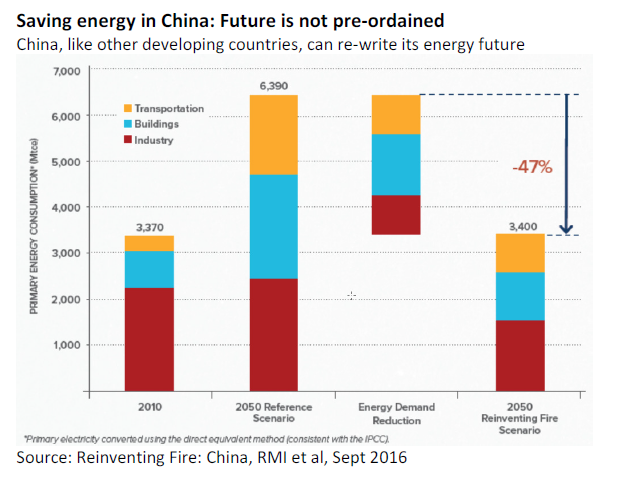 The report claims that China can get by with 47% less energy by 2050 compared to the so-called reference scenario – more or less a business-as-usual case (graph 2). How can such a feat be accomplished? It is classic Lovins: you add up the savings from various sectors through an elaborate bottom-up analysis of how much energy can be saved from each sector of the economy (graph 3). 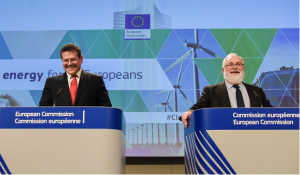 The starting point in each sector and for each end-use is to ask how can we best deliver the desired energy services at the least cost, tacitly including the cost of carbon emissions, water consumption, environmental degradation and so on in the process. Along the way, the report reshapes the industry, the transportation sector and buildings – why not? Every sector can be made far more efficient and more productive, while saving energy and money. 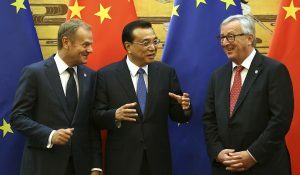 Since China is on a fast growth trajectory – adding infrastructure, buildings, factories, harbors, airports, ports, roads, power plants, you name it – it can select its development path and future destiny much faster and cheaper than mature economies where all infrastructure is already built and hard to replace. 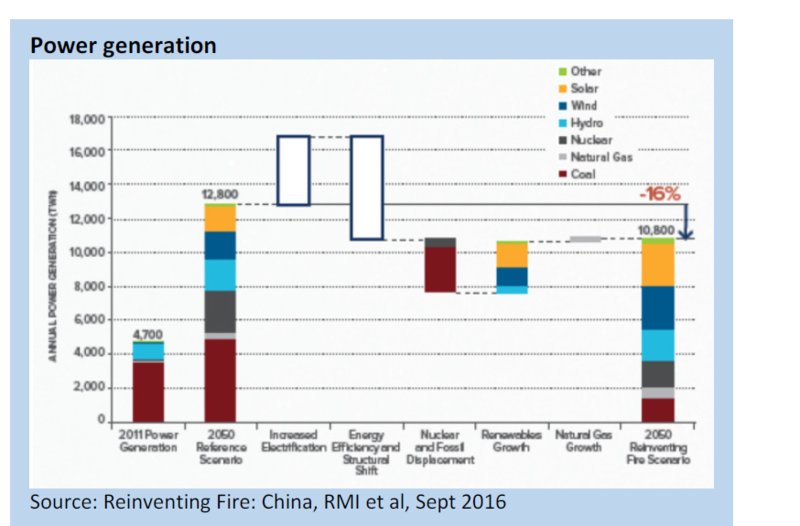 In the process, China’s overall energy consumption shrinks while it transforms from roughly 80% dependence on dirty fossil fuels to roughly 80% non-carbon emitting energy resources including nuclear by 2050. 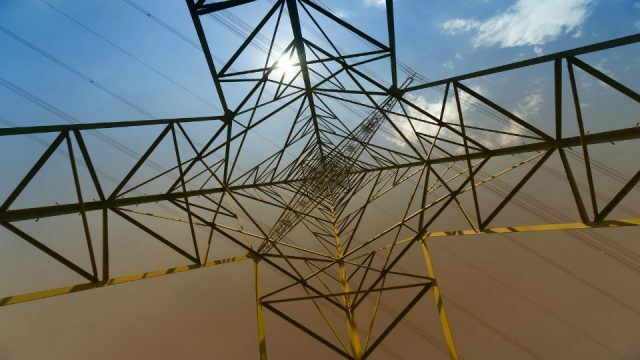 The results of the study are short of stunning, especially in the electricity sector where consumption is projected to peak somewhere around 2040 with significant drop in greenhouse gas emissions compared to the reference case. 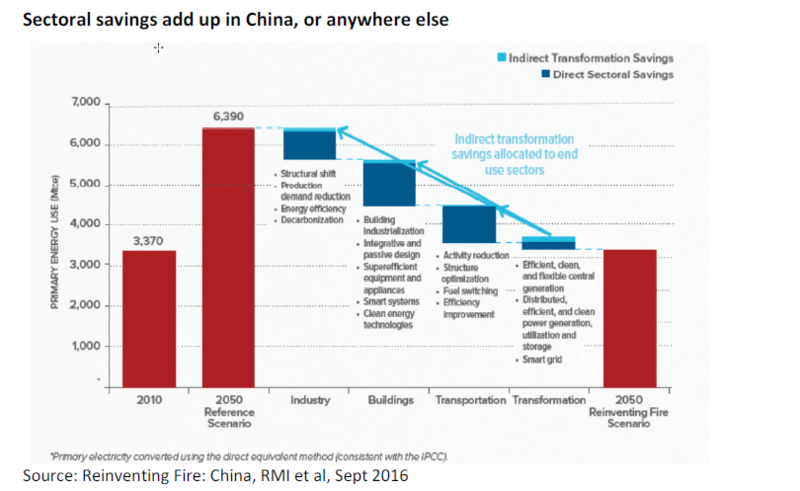 China’s power generation mix is equally transformed along the way, not only using less primary energy but far more of it coming from non-carbon resources by 2050 (graph 4). For the skeptics, the road map envisions China’s rapid transformation from a rural, developing economy to a largely urbanized advanced economy by 2050 in 3 phases from 2010-20, 2020 to 2030 and through 2050. What is needed now is a repeat of the same exercise for India, Indonesia, Pakistan, Nigeria, Iran, Turkey, Saudi Arabia and numerous other populous and rapidly developing economies of the world so that they too can pursue a cleaner, greener and more sustainable growth trajectory rather than pursuing outdated policies of the past. Wouldn’t that make perfect sense, especially in view of COP21 targets? Like China, these countries are adding new infrastructure at a rapid pace. What better opportunity to get it right from the start, rather than build the wrong one, only to replace it again. 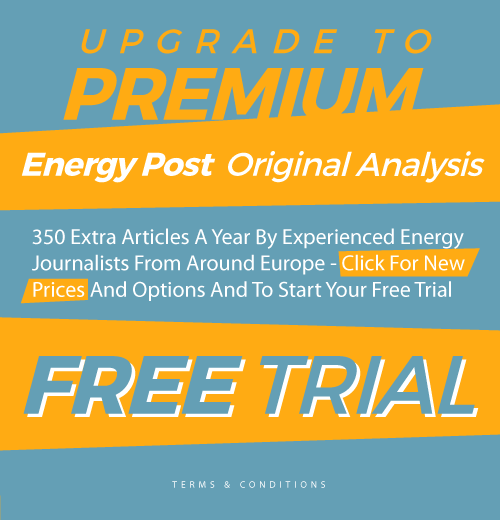 This article was first published in the November 2016 edition of the highly recommended newsletter EEnergy Informer, published by US-based energy expert and author Fereidoon Sioshansi. It is republished here with permission from the author. Those last words are very true. And probably nothing we have to worry about: it will happen simply because of economics. Renewables like solar and wind are already cheaper than coal, gas or nuclear many places in the world, especially in tropical areas where most of the large developing economies are situated.